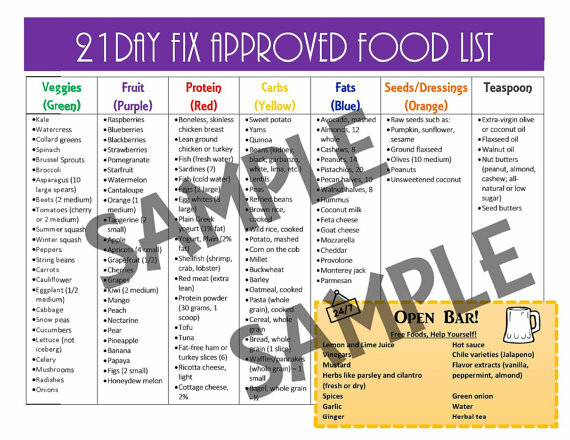 21 Day Fix Food and Shopping List: Container Approved Items! 21 Day Fix Food List and Shopping Ideas! One of the largest components of the 21 day fix exercise program is the nutrition and color coded portion containers that are meant to be followed alongside the workout videos. While following the nutrition plan, you’ll need to have a clear idea of what you can eat while on the program which is why you’ll need the 21 day fix food list and meal shopping ideas so you can get started. Let’s break down each of the containers and the foods that you can have alongside the program. Each day you’ll eat a number of green containers depending on your calorie bracket level found on the tally sheets and container tracking printables you are assigned. For the 1200-1499 calorie bracket, you’ll eat four green containers or four servings of vegetables a day. It’s important to note that potatoes are NOT considered a vegetable in this program, they are considered a carb. This includes sweet potatoes! You’ll eat less fruit than vegetables on this program because fruits naturally have more sugars and calories than vegetables. For the 1200-1499 plan, you’ll have two purple containers/servings of fruit. The 1500-1799 plan requires 3 servings. While following the 21 day fix program, you’ll eat plenty of protein to help you build lean muscle. Try to include protein throughout your day rather than just at the beginning or end, it’s important to be incorporating all food groups throughout the day to keep your body properly energized. Most people will get the yellow container for the first time in their package and think “What on earth is this?”. I even saw a review online of a woman returning the containers and complaining that they were “too small”. Haha! Well, that is how you will lose weight! By eating smaller portions. If the containers were huge, you’d be gaining weight and that is the whole purpose of the 21 day fix program! Healthy fats are good and important for your weight loss progress. Healthy fats have mono-saturated or poly-saturated fats which are good for you and help trim the waist line. What we want to avoid is saturated fats and especially trans fats. Common Blue Container Ideas: Avocado, hummus, almonds, peanuts, pistachios, cashews, (note: all nuts are not created equally! You can have a certain number of nuts per serving, don’t just fill the blue container!) Light cheeses such as cheddar, mozzarella, Parmesan, etc. For the orange containers, I generally don’t follow any specific recipe. Sometimes I’ll make a protein ball recipe and use an orange container full of coconut and other times I will fill it with a light vinaigrette low-calorie dressing. Some dressings have less calories than others. Italian Light has only 5 calories per tbsp, so I use two orange containers. Whereas Balsamic Light has 15-30 calories per tbsp, so I will only use one orange container which equates to around 2 tablespoons. I hope this 21 day fix food list has helped you with some ideas of the most common foods you’ll eat throughout the day on the program. What foods do you always get at the shops? Comment below and share your ideas! If you click on the image above, you’ll be directed to an Etsy shop that has super affordable bundle packs of worksheets you can instantly download and use to help you on your weight loss journey with the 21 day fix. You’ll get the appropriate tally sheets for whichever calorie bracket you are following, a results tracker, workout calendar and the 21 day fix food list! Do u have to use only foods on the food list or for example a veggie container can u put any veggie in it or does it have to b from the veggie list? Thank u.
so for all the containers u can put anything in them as long as I put protein in the protein container, a carb in the yellow container, u don’t have to use only the foods on the food list u can use things not in the food list. Just trying to get this straight. Thank you. Generally, yes! There are a few exceptions. For example 1 yellow container = 1 slice of bread (since a piece of bread doesn’t fit in a container) and thinks like nuts it also varies. Nuts are blue containers, but you can have 12 Almonds = 1 blue container. 2 eggs = 1 red container. These are a few of the exceptions because nuts are higher in calories. Also the food list is there to give you ideas. You shouldn’t fill a red container with high fat ground beef for example, try to keep the protein low-fat and high protein. Quinoa, broccoli, spinach, chickpeas are considered to be foods high in protein (red container), but for the program quinoa and chickpeas are a carb/yellow, and broccoli and spinach are green. How does that work if one is trying to increase their protein intake ? Can’t measure those in the red container? Hi Trisha! You’re absolutely right in that quinoa and chickpeas have plenty of protein, but they also contain a high amount of carbs which is why they are reserved for the “carb” area – One serving of boneless chicken breast has a much higher ratio of protein per serving and has no carbs versus chickpeas or quinoa that have a higher protein/carb ratio. If you are a vegetarian, you might have to make the exception due not having as many protein options available. I don’t think it would hurt if you substituted 1 red container or so a day to use for chickpeas or quinoa as a protein instead of a carb, but not to overdo it or you would really increase your carb count for the day otherwise. Hi, just wondering where milk fits onto this? Hi Jess! Milk would fit under protein – but there isn’t as much calories in fat-free or 1% milk as there is the same size serving of yogurt or cottage cheese. I would count 1 red container of milk as 1/2 a protein for this reason.